I accidentally ordered more die cuts for the Big Shot. 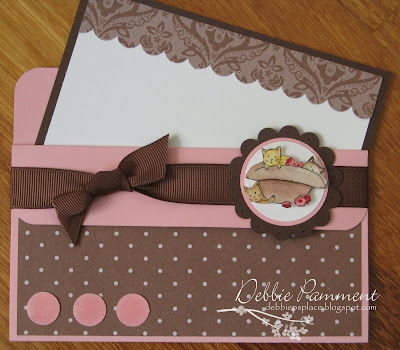 I said I was going to wait until the new catalog but Lorri Heiling made me this super cute card and I wouldn't be a real friend if I didn't show my appreciation by copying her! This is the first of several Mother's Day cards I'm working on. My Baby Benjamin is 13!! 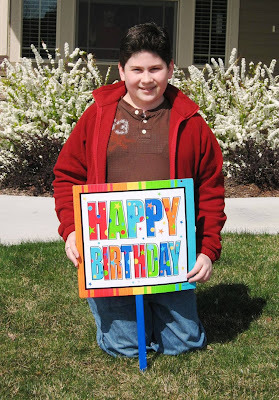 Although he smiled for the picture, he was less than happy about the sign in the yard. At least we finally had a sunny day!! 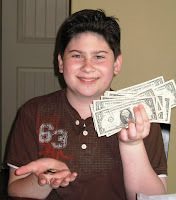 He hauled in about $200 in cash by the time the day was over! 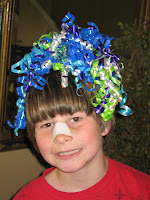 Years ago the boys started this silly thing of putting the bows in the hair of the brother who wasn't celebrating the birthday. This year it was particularly funny with Nicholas in his nose cast...he kind of looks like the scarecrow in the Wizard of OZ ! My Australian Demonstrator friend Debbie Pammet mad this adorable Tote-ally Awesome Tote. 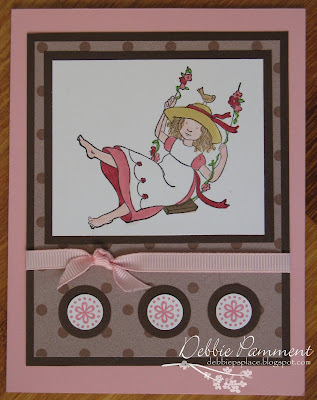 I love the colors and the stamp set she used!!! Great job Debbie! You can see her blog here. Ok...everything I see from you I want!! I am gonna have to buy this die cut too...I have seen so many cute things with it! I love the little half flower on the sentiment! Your blogs amazing I have an award for you on my blog. 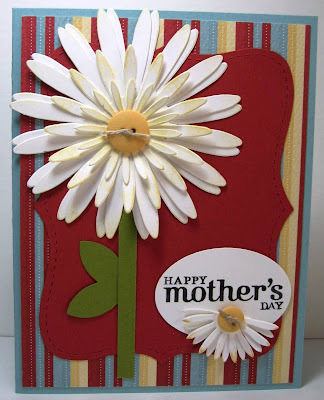 Love, love, love the daisy card! Oh so pretty! I love that Daisy!!!! Have that die on order - Yippeeeee!!! Thanx too for your kind words on my tote, your tutorial was FABULOUS!!!!! Oh Becky, please find out where she got the cats stamp. I have 3 cats and would love to find this stamp. Thanks - email me please. I recently discovered your blog and am in love! In fact, I've decided you deserve the Kreativ Blogger award! Thank you for sharing your wonderful creativity!!!! I love what you did with this flower--especially the little one that looks like a cone flower!! I had to buy this die as well and it looks pretty awesome in pink passion, too. :) I've been peeking in on your blog now and then, you have some fabulous things to share! I also like that I can relate to your place in life as my oldest DS will turn 13 next month. You create the most adorable items! I wish I could go and hide in my stamp room and just try to be as creative as you. I did finally get time to make the Garden Tote. There is a picture on my blog with my finished product. Thanks so much for a wonderful tutorial Becky!!! LOL @ it being an accident ;) I need to use that sometime soon...haha! I really do want those flower dies! Oh Chloe wanted to do the Jonas Brothers too but LUCKILY we'll be on vacation when they are here...YEAH! 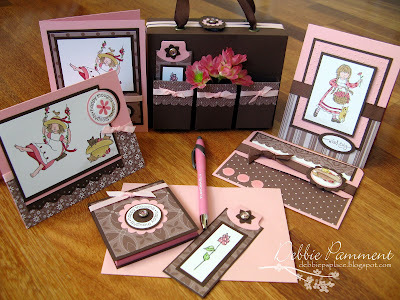 Loved this card so much I cased it, see it on my blog at http://mamia-stampingsanity.blogspot.com. Thanks for the inspiration. I love what you did with this flower--especially the little one that looks like a cone flower! !